Samuel McIntyre (January 16, 1757 – February 6, 1811) was an American architect and craftsman, Chestnut Street District, a legacy to one of the earliest architects in the United States, Samuel McIntyre is a primary example of Federal style architecture. Born in Salem, Massachusetts to housewright Joseph McIntyre and Sarah (Ruck), he was a woodcarver by trade who grew into the practice of architecture. 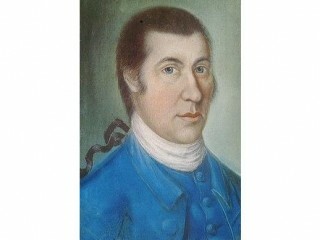 He married Elizabeth Field on October 10, 1778, and had one son. He built a simple home and workshop on Summer Street in 1786. Starting about 1780, McIntyre was hired by Salem's pre-eminent merchant and America's first millionaire, Elias Hasket Derby, for whose extended family he built or remodeled a series of houses. McIntyre taught himself the Palladian style of architecture from books, and soon had a reputation among the city's elite for designing elegant homes. In 1792, he entered a proposal in the competition for the United States Capitol. After 1797, McIntyre worked in the style of Boston architect Charles Bulfinch, who had made fashionable here the neoclassical manner of Scottish architect Robert Adam. Unlike Bulfinch, however, whose designs were featured across the East Coast, McIntyre built almost exclusively in New England. His wooden or brick houses were typically 3 stories tall, each with 4 rooms around a central hall. In 1799, he went into business with his brothers, Joseph and Angier McIntyre, who erected the structures, while at the workshop he oversaw various ornamentations, including the swags, rosettes, garlands and sheaves of wheat which dominate their interior wooden surfaces. McIntyre's Salem works include the Peirce-Nichols, the Peabody-Silsbee, the Gardner-White-Pingree, and the Elias Haskett Derby residences. His public buildings, all in Salem, are Assembly Hall, Hamilton Hall, Washington Hall and the courthouse (the latter 2 demolished). He was a skilled artisan, especially in furniture, and his skill extended to sculpting. Among his works are busts of Voltaire and John Winthrop, the first governor of Massachusetts. Both are now owned by the American Antiquarian Society in Worcester, Massachusetts. In 1981, Salem created the Samuel McIntyre Historic District. Containing 407 buildings, it is the city's largest and this district is the location of the largest collection of homes from this colonial period in all of America. Samuel McIntyre house and workshop was located Summer Street, at the intersection of Chestnut Street where many grand mansions designed by Samuel McIntyre display the profits of the Old China Trade these streets display the roots of the Colonial history of the United States. The Samuel McIntyre Historic District represents the greatest concentration of 17th and 18th century domestic structures anywhere in America. It includes McIntyre commissions such as the Peirce-Nichols House and Hamilton Hall. The Witch House or Jonathan Corwin House (circa 1642) is also located in the District. Samuel McIntyre's house was located at 31 Summer Street in what is now the Samuel McIntyre Historic District. In 2011, a mahogany side chair with carving done by Samuel McIntire sold at auction for $662,500. The price set a world record for Federal furniture. McIntyre was one of the first architects in the United States and his work represents a prime example of early Federal-style architecture. Elias Hasket Derby, Salem's wealthiest merchant and thought to be America's first millionaire, and his wife, Elizabeth Crowninshield, purchased eight chairs as a set that were hand-made and hand-carved in the late 18th century.